Happy Wednesday, everyone! As I hinted at last week, we’re going to be trying something a bit different with this blog area for the foreseeable future. Instead of vague, disconnected pieces about the world, this space will be taken up by an ongoing story of its own! A completely different character having their own little adventures in the world, in full prose with a possible sketch here or there for fun. 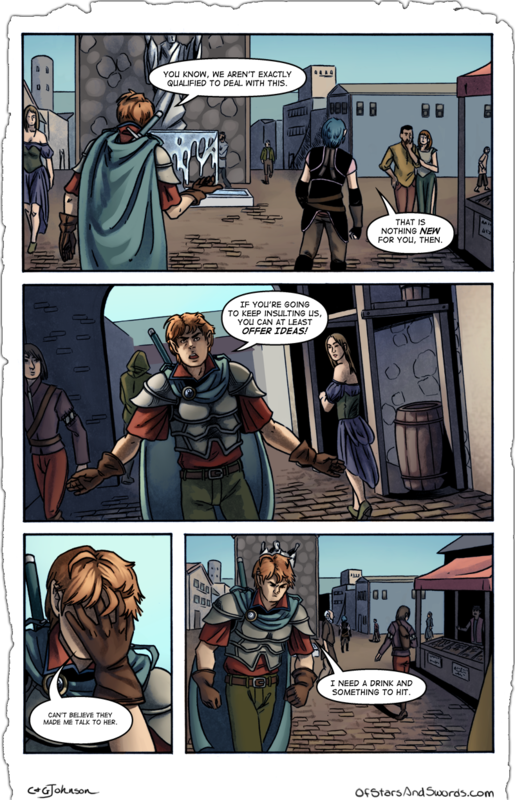 Each week, there will be a new comic page AND a new piece of the prose story! And hey, it’s possible that certain things in the prose might hint at things to come later in the comic itself…characters, monsters, evil plots, places, etc. One never knows! As always, we hope you enjoy both! Check out our Facebook page if you want to leave us a note, or you can find us on twitter. All that info is over there in our About page. Have a great week, everyone. There was only a single road to the city of Oriona. It cut south, down from the central mountain range on the continent, and went no where else. A few small villages had sprung up over the years on the road, but there was little else. The further south one went, the harder it became for most to live comfortably, if only for the view. Across all of the world, Oriona sat closest to what all called The Wall. A great barrier of red that stretched from the bottom of the sea to the very tip of the sky. The Wall was the first proof that the world was round, as sailing it’s length returned a ship to it’s destination after a very long journey. There was no way through this Wall. All had legends that told of what waited on the other side, but few believed or even cared to think about it. The city of Oriona, on the southern tip of Orincia, a large island to the south and across the Achaean Sea from Cyronell, had been founded by a group of mages, sages, and philosophers dedicated to the study of the mysterious Wall, just a few miles away. And so it has remained, for hundreds of years. Few travel to Oriona, for there is little but a strange city dedicated to a strange thing. Though all of Orincia is comprised of independent city-states, Oriona stands apart even then, an unusual city that the rest do not understand and simply choose to ignore. For obvious reasons, travelers going south along that single road are few. Yet, as carts passed north, empty from delivering food or other essential things that the people of Oroina rarely dealt in, a single traveler was walking south. Despite his direction, there was little remarkable to see in regards to the traveler. He was of average height for an Orincian man, dressed in a simple robe that did nothing to hide a patched-together set of leather armor. There was a shortsword at his hip, and his build suggested he had many years of practice with it. As Oriona’s marble walls grew in front of him, the traveler came to realize that the only thing that would really cause him to stick out in a crowd was his complexion. Most that lived this far south were of darker skin and hair, and while he was tanned, his hair was a light enough brown to look like a bright flame in a sea of black. Perhaps a cloak would have been a good idea. But it was too late for that, and the traveler was still sure that his hair color would be the least of his worries. He had a very specific goal in traveling to Oriona, and considering the man that he was out to find, the traveler was fairly certain all his problems would revolve around that point. The guards at the gate did little but eye him for a moment as he passed them, which the traveler considered to be a sign that things would go well. Once he was within the city, the traveler took a quick moment to get his bearings. Oriona was built out and up. The street that ran ahead of him was a canyon between brightly painted marble buildings, four or five levels high. Rickety-looking, wooden bridges crossed over the streets at the various levels. The streets themselves were fairly populated, which he had not expected, and by all kinds of peoples. Humans, Elves, Dwarves, near-Giants, and…things that the traveler didn’t recognize but was fairly sure weren’t wild monsters since they all seemed to be behaving normally enough and even shopping at some carts. Oriona was a strange place indeed. Before he could do anything, though, the sound of a large, angry crowd began to grow from a side street. The traveler turned to see a huge group coming his way, yelling various things and looking angrily all around. Others were joining as they got close enough, too. And then he was able to make out what the main chant of the crowd was. The traveler’s eyes went wide and he immediately began to look for an escape. But as his eyes darted around he noticed that everyone was ignoring him and instead heading for the crowd, which he realized was dragging someone along in the center of it all. Carefully, Cato attempted to keep up without being implicated with the crowd. At least a few of them weren’t speaking a language he understood, so hopefully they wouldn’t figure out his relation to the source of their ire. “Kyros? What is going on? !” Cato did his best not to yell. Asking questions like that instead of yelling obscenities seemed dangerous at the moment. on. He stood there, in the middle of the street and staring as they continued onward, and could only shake his head. So his younger brother was about to be executed for Gods-only-knew what, probably to be done swiftly from the anger and growing size of the crowd, once they reached their destination. Cato was going to have to deal with that quickly, and at that point he decided to reassess his view of the day. It was no longer a good day. Though, on the plus side, it had only taken a couple of minutes to actually find his brother.